In all history, within everything that is great in power, the tongue is seen time and time again to have great power. It can have the power to kill and the power to save. How great is the tongue? It’s so great, but so small; it can move a nation to be rich or to be poor. By the tongue, Germany became a country that killed Jews, and by the tongue, Germany became free. By the tongue, a judge can send you free, or have you put to death. By the tongue, God sets the free, and God sends to Hell those who rejected him. The tongue is a sword that cut’s deep. Time and time again, someone is made fun of by the tongue, and they kill their self, because the tongue was used. The power of the tongue is good and evil. We must use it for good, as we walk with Christ. Not saying that if you say bad word, you’re going to Hell and have no way out. Each day we need to make it out goal not to sin. To be holy, for God is holy. Also, how can someone say one thing and do another? That is hypercritical to do. We can’t be living two lives. 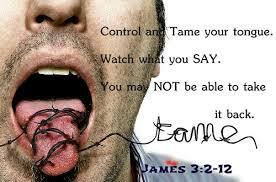 We must then, walk our talk, so watch out what is coming out of your mouth, your tongue is a sword, remember that. Have few questions, which I want you to answer to yourself and to God. What is your tongue doing? How are you using your tongue? When your tongue speaks evil, means that you are more evil then good. Are you follower of Christ, or devil? Your tongue will speak what your life lives. This entry was posted in Study of James and tagged Power, Power of the Tongue- (Study of James- 16), Tongue by Keith West. Bookmark the permalink.